For those that need a bit of background: I work in a library at a small college – but a college that expects its students to write a lot. And to hold their papers together with staples. Also, at this particular college, the library gets a lot of use, and so, our staplers get a lot of use, too. And not all loving use. Also, some students walk away with our staplers. What this boils down to is that we go through a lot of staplers. A crazy lot of staplers. Enough so that we started investigating ways to encourage our students to be a little more gentle with them, and to leave them in the library. We started off by labeling our staplers with the oh so creative label of “RefDesk” or “Library: Do NOT remove.” The staplers would still disappear with pretty alarming frequency. We tried chaining the stapler to a table, but when the stapler broke (as it always did), it was a pain to unchain the broken stapler, and then attach that chain to the new one. Plus, there were still plenty of times when we’d look up from the reference desk to see the chain dangling off the side of the table, with nothing on the other end. We even bought a beeper thingy to help you find lost keys. Basically you attach a beeper to the stapler, and then you have a remote that is supposed to set the beeper off when you push a button. We thought that might help us find the stapler if it just moved to another part of the room. But the beeper just didn’t work well. I don’t know if it was the book shelves or what, but when we pushed that button to find our wayward stapler, the beeper wouldn’t go off, even if the attached stapler was near by. Our second problem was that when the staplers did stick around, they broke very quickly. Many would jam, some would just cease to work for more mysterious reasons. We tried a lot of different types of staplers. Ones that guaranteed that they’d never jam. Ones that were surprisingly expensive. And as good librarians, we even sent an email to a listserv asking other librarians for their preferred staplers, and tried those recommendation. We experimented with different types of staples, too. But to our surprise, it didn’t seem to make a bit of difference which stapler we used – we were still spending an insane amount of time trying to perform emergency stapler surgery at the desk. We started keeping a pair of needle-nosed pliers in our drawer to help with the jams. But they still broke, and once a stapler started to jam a lot, the best needle-nosed pliers in the world wouldn’t help. We briefly tried going without a stapler since it was starting to get expensive. The outcry was great and immediate. How could we do this to our students? What would the professors do when faced with papers that might get out of order, theses becoming even more disorganized, problem sets answered out of order. For the love of all that’s holy, won’t somebody think of the papers?!? So we figured that if we had to provide staplers, and any stapler we chose was going to break any way, we’d just go back to an inexpensive basic stapler, and buy boxes and boxes of them. Then, if a stapler went missing, or it got broken, we’d just put a new one out. No more worrying, no more experimenting or trying new combinations. At about the same time, we heard an interesting story from our colleagues at the computer helpdesk in the next building over. They also had stapler woes that mirrored ours. And in a fit of bitterness, instead of making a label for a stapler that said “Helpdesk” they gave it a name, one that I’ve since forgotten, but let’s say it was “Bud” (a helpdesk colleague tells me the name was actually “Charlie”). Bud far outlived any other stapler they had. He was returned. Students seemed more respectful and less likely to staple harshly with him. We were intrigued. Alice was our first. She was introduced to campus in Fall of 2010, along with a sign explaining her background, and the travails of those who came before her. Alice is our newest stapler. She is the latest in a long line of previously-unnamed compatriots who valiantly gave their lives in the noble service of holding your papers together. They endured—until they could endure no more—horrific slamming, pounding, whomping, and jamming, multiple painful staple extractions, and the unrealistic expectations of those who thought a mere office desk stapler could bite through a fifty-page stack of reserve readings. 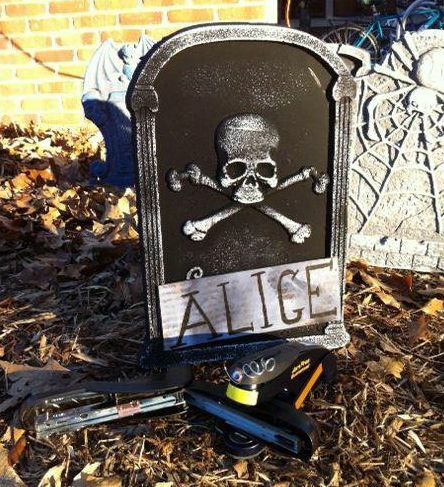 Each stapler after Alice also had a sign with a little background on that stapler. 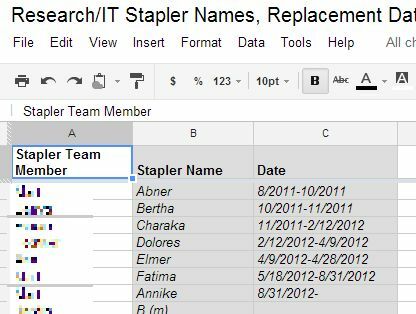 It got to be draining for one person to come up with background on all the staplers, so we assigned librarians to choose a name and make a sign for the next few staplers. That first year, we went through Alice, Bert, Claudia, Diego, and finally, Edna. That may seem like a lot, but that was far slower rate of stapler loss than we’d previously been through. The next year, we went through Abner, Bertha, Charaka, Dolores, Elmer, and Fatima. It seemed like we’d stabilized on a 5-6 staplers a year stapler loss rate. Compared to previous years, this was a huge improvement. We’re librarians, of course we keep a spreadsheet on our staplers. There is at least one drawback to naming the staplers. When they’re given names, it’s much easier to become attached to them. On many occasions, I’ve gotten quite upset when Dolores or Claudia or one of our other staplers went missing. Before calling customer support for advice, we tried to clear jams by stapling over a pencil. That resulted in the loss of at least one pencil. But while the staplers were lasting longer, they were not so good at holding together papers with more than 20 pages. And there were plenty of students printing out papers at least that long if not longer. We finally settled on getting a heavy duty stapler. Which we named Butch. Butch was massive, and tricky, and picky, but he sure did staple through a lot of pages – and on at least one occasion, a pencil. Butch was complicated enough that I’ve had to call a customer support line to get help with un-jamming him (the woman on the other end of the line was extremely helpful, though she did have to look the answer up). 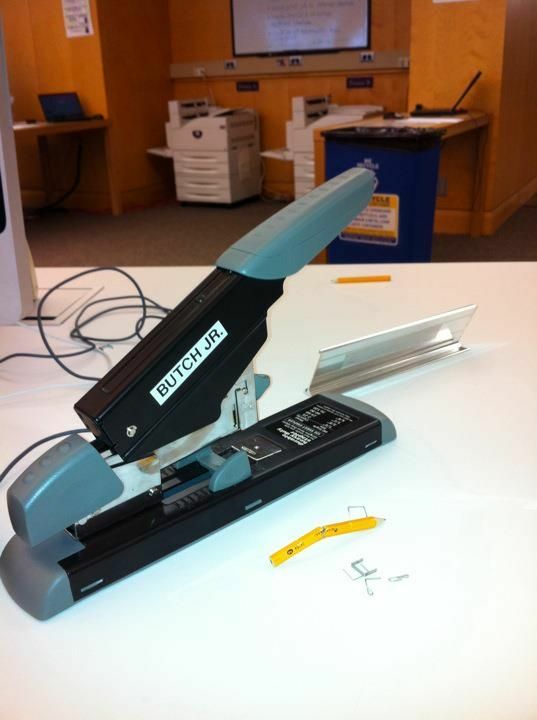 We keep Butch right near us at the reference desk, because filling Butch was hard, and heaven help you if you put non-heavy duty staplers in to Butch or try to staple a stack with fewer than 20 pages. Still, we’ve been through a few Butches as well. I don’t remember what happened with Butch and Butch, Jr, but Butch the 3rd recently got heavy duty staplers stuck in his base, and even when we’d remove them, the next time someone came to staple, they’d get stuck again. That led to my second call to stapler customer support (tell me, how many of you have called for stapler support? And how many have called twice? That’s what I thought). Thankfully, since our Butches are not cheap staplers, Butch 3 was under warranty, and thus, Butch the 4th arrived in the mail just a few days later. 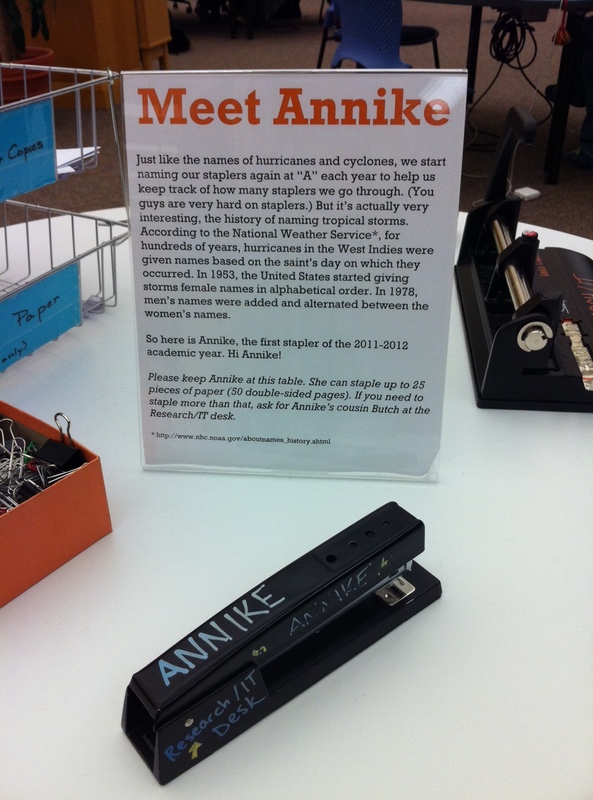 Annike, our longest-lived stapler to date. May she continue to staple papers for many months to come. Our biggest breakthrough came this fall. When we put our new stapler, Annike, out, we couldn’t find the label-maker that we’d previously used to label all of our staplers. So in desperation, a couple of librarians used shiny permanent marker and wrote her name on the stapler. Annike has lasted the whole fall term. She’s still going strong (though finals start on Saturday, and I’m kind of scared I may have jinxed her). Still, if this rate continues, we’ll only go through 3 staplers at most this year! Name the staplers, it’s fun, and people seem to identify with them a bit, and treat them a bit better. Signs with the background stories for each are great, too. Spread the work around so someone isn’t saddled with being creative all the time. Decorate the staplers, because that seems to help even more. Invest in a heavy-duty stapler (with a warranty) to help with the big jobs. Don’t be afraid to call the customer support line for the stapler. This has nothing to do with the care and feeding of staplers, which is why it comes after my conclusions. 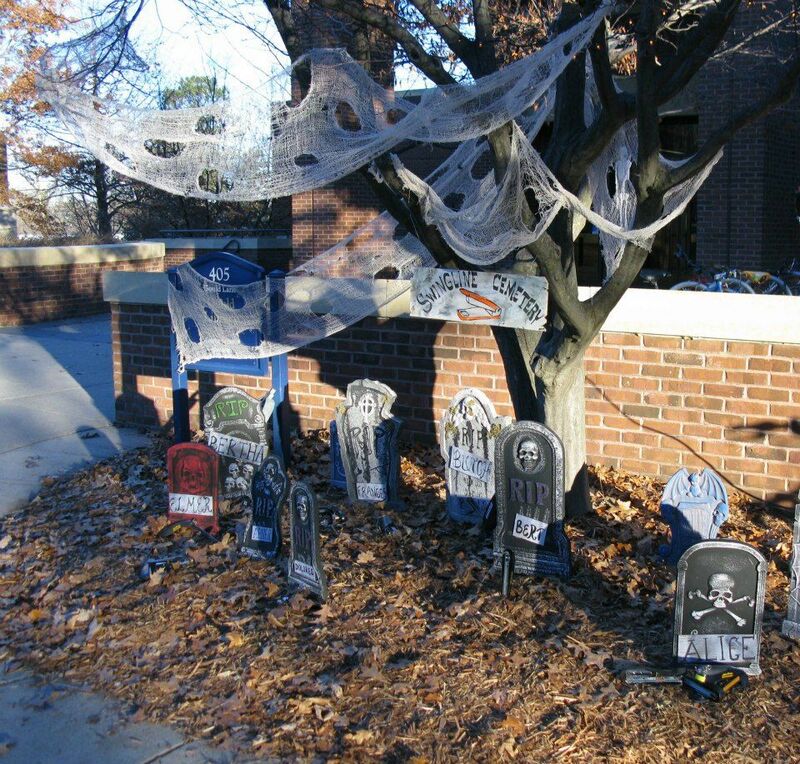 Since naming our staplers, we hadn’t been throwing them away, but instead were keeping them in a box in the back that was labeled “stapler cemetery.” This year when we were trying to come up with an idea for Halloween decorations, we decided to do an actual stapler cemetery, which we set up out in front of the library. Swingline Cemetery. I am a good librarian, but I am not artistic. Luckily, others at the library are. 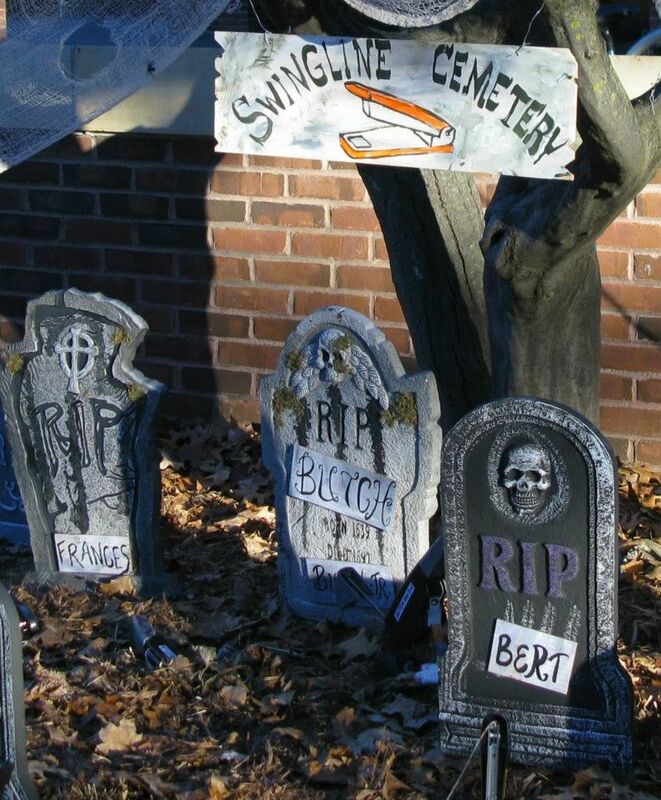 The full cemetery. Not big, but it doesn’t need to be for staplers. 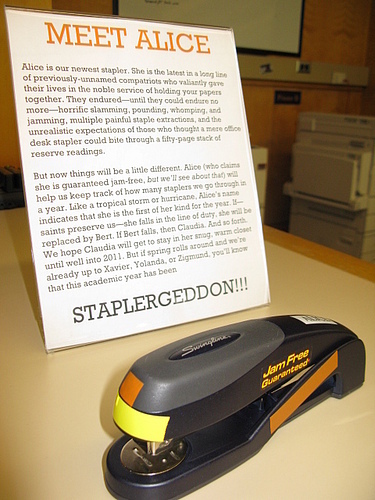 Beloved, Alice, our first named stapler rises from the dead to feast on stapler flesh. Update, November 19: This weekend, the final weekend of our fall term, Annike stopped stapling papers. She nearly made it the full term, and holds the record for our longest-lasting stapler. She has been replaced by Balil, who will undoubtedly serve the library admirably. I would like to say “HI” to your awesome ALICE staplers .. thanks for sharing above experience ! hello there, i just wanna say thanks you for sharing great article. You really did a great job. You have nicely described the stapler biography. I like your idea. That is outstanding and informative. Thanks for sharing this. Have a good day. Lovely story! Still my advice – to buy Rexel Polaris 1420 Electric Stapler with Hole Punch Function, 20 Sheet Capacity, Silver and Black, 2101179 on Amazon! We have 2 for nearly 10 years! Thanks for stopping by! I'm Ann, a science librarian, mom of two, lazy baker, and casual gardener. These are my thoughts on infertility, parenting after infertility, librarianship, food, and anything else that catches my attention. Not necessarily in that order. Header image is from Public Domain Pictures .net. 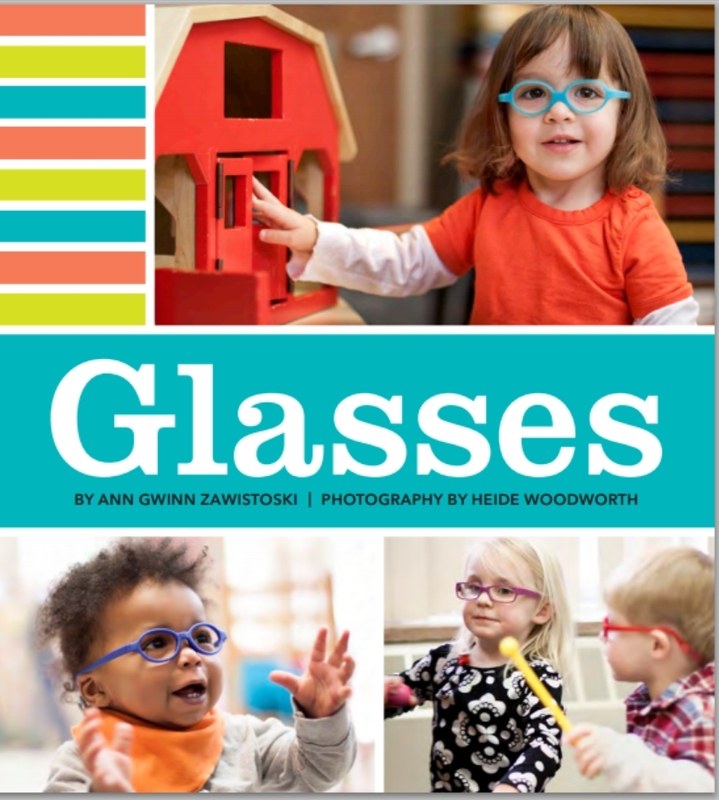 have a baby or toddler with glasses? If you arrived here looking for information on babies or young kids and glasses or patching, please visit my For Little Eyes site.